There is a common saying “Content is King” often used and said and is been doing around for years now. Its only so because IT ACTUALLY IS. It’s a simple logic if something goes along for years, it has to be of great potential. Parle-g is still brought today and so was it 50 years ago. Same goes the case for content. Content marketing these days seems like the most easiest job to do, write a few blogs here and there, add some bold posts to your sites and its done! But, probably it’s not just it. When you write you need a good word bank, a strong key word , a bold and strong research plan, a pro game at Grammar and oodles of creativity. Content so to say, is essential everywhere, content is what takes you ahead. Content also has a marked influence on the marketing. A good piece of write up would always have more reader and hence more follows to your blog or site. Content Writing is more than Advertising – It’s an Investment. You build on a lot of things with content writing. The most important thing that you develop is loyal customer bases. With constant blogging and update with stories, people wait for blogs to be uploaded. Also delivering quality content makes you a “Brand Authority” and customers look up with faith and are left demanding for more!! Content Marketing is a value to be harnessed, no matter what business you are in you need to be unique to be competitive enough. A good tagline will take you more father than a humongous marketing scheme will. 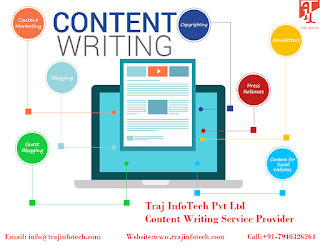 We at TrajInfotech, offer all kinds of content development as well as content marketing, so if you are looking for further assistance, Contact US.